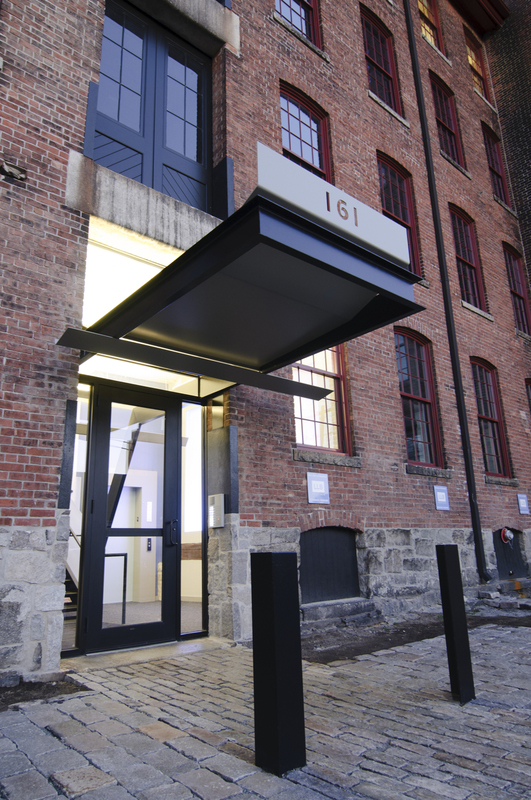 The Design Exchange is one of the historic redevelopments in Rhode Island and brings together creative industries in a unique, collaborative work environment. Originally constructed in 1880, this four story brick building was once part of the Rhode Island Cardboard Company and has been completely rehabbed to meet the demands of today’s innovative entrepreneurs while respecting Pawtucket’s industrial past. 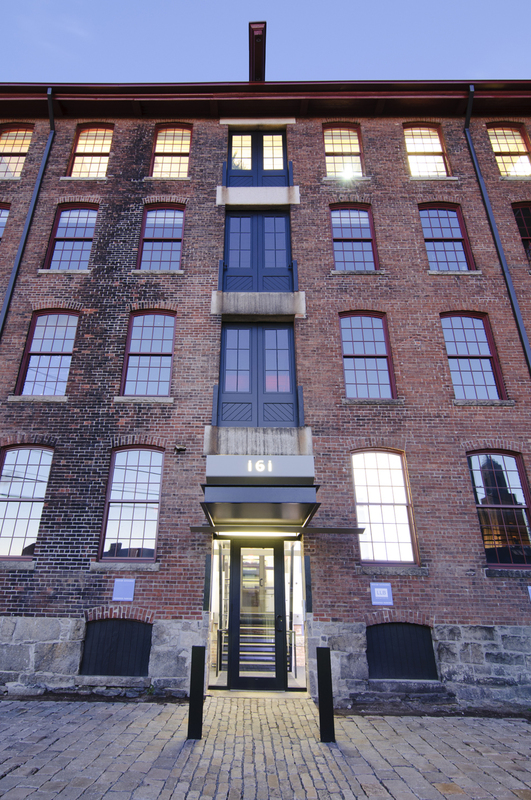 Winner of the prestigious Rhody Award for historic preservation and reuse, the Design Exchange is part of the Armory Arts District and the Exchange Street Historic District. Each suite has ten foot high ceilings, seven foot tall windows, heavy timber columns and beams with original plank ceilings. Amenities include new electrical and tele/data service with ample capacity to meet the demands expected of heavy technology users, new thermally-glazed windows, high-efficiency heating and cooling systems, full sprinkler and fire alarm systems, a sleek passenger elevator, and handicap-accessible restrooms on each floor. 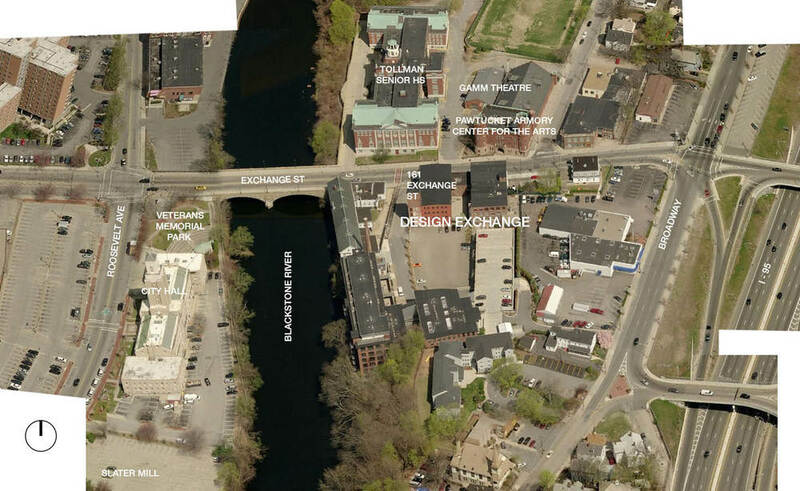 Parking is available on site as well as in several lots in the downtown Pawtucket area. The Design Exchange is just minutes to I-95 and easily accessible to Providence, the airport and metro Boston. LLB Architects, Lerner Ladds Bartels, is an architectural practice built upon a distinct project approach defined through comprehensive relationships with our clients. Since our founding in 1936, a commitment to responsive and thoughtful design, integrated project process, and New England practicality have remained our primary principles. Fuzion Design is a design firm that blends art with innovation to deliver leading product development and graphic design solutions that drive new products and grow business. Beyond their product development and graphic design abilities, Fuzion is instrumental in communications support and social media management. Their group effort and hands-on commitment to working with small and large businesses ensure clients forge a consistent brand message and collateral that supports sales force. Since 1980, Catherine Holleman Branch and Kathleen Manchester have earned a reputation for creating highly detailed interiors rooted in classic design, while maintaining a modern outlook. Drawing on 30+ years experience, Hollester Interiors decorate, renovate and plan spaces based on a solid understanding of the architectural context, ensuring that spaces are functional as well as beautiful. Clients are guided through the many phases of decision making to achieve extraordinary results. Wozny/Barbar & Associates, Inc. is a full service consulting firm specializing in the engineering and design of heating, ventilation, air conditioning, electrical, plumbing, fire protection, fire alarm and energy management systems. The firm was founded in 1988 to provide clients with multi-disciplinary engineering services from conceptual design through construction administration. Orange Square delivers high-impact marketing communication to help mission-driven organizations achieve true change in the world. Orange Square develops strategy and connects it to design to engage and motivate target audiences and to solve the most critical communication challenges. The Orange Square team of marketing experts, visual designers, web developers, and writers work with clients to achieve their organization’s communication goals. Team members are personal communication gurus, right hand problem-solvers, and marketing communication experts. Photographer Robin Bowman, a 2005 W. Eugene Smith Memorial Fellow, earned a degree in anthropology at Wheaton College and studied at the Maine Photographic Workshops Her photographs have appeared in publications worldwide, including The New Yorker, Life, Newsweek, Time, People, Stern, and Paris Match. Her award winning book IT’S COMPLICATED: The American Teenager, published in 2007, has since inspired The American Teenager Project; a national photography and oral history program, which she co-founded, for youth that aims to combat social division. Colorfast is a new digital inkjet textile design and printing company, founded by Amy Bernhardt. With a degree in printmaking from the Rhode Island School of Design and 20 years in the design technology industry, Amy received a 2014 Rhode Island Innovation Fellowship from the Rhode Island Foundation to bring Colorfast to reality. See a sample of her beautiful designs on her website. Delin Design is a brand, print and interactive studio started in 1996. Our team have been diligent in creating powerful, persuasive and "tangibly" branded solutions for B2B and consumer marketers. The studio brings together strategic thinking and design innovation to guide perceptions, strengthen brands and inspire action. In a crowded market, Delin Design gets you noticed with thoughtful and proven results. With our process, and an endless passion for design solutions combined with strategic business objectives, we work hard so that both our clients and the project’s designer are truly fulfilled. Interested in moving to the Design Exchange? Email us! 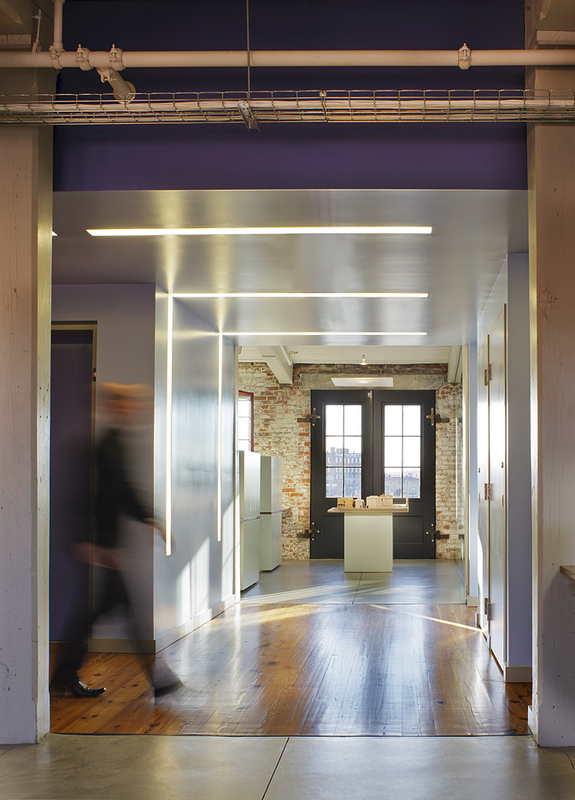 The Design Exchange is one of the newest historic redevelopments in Rhode Island and brings together creative industries in a unique, collaborative work environment. Originally constructed in 1880, this four story brick building was once part of the Rhode Island Cardboard Company and has been completely rehabbed to meet the demands of today’s innovative entrepreneurs while respecting Pawtucket’s industrial past.